Pictured above left, our Patron, Christine Walkden, Tom Carter (Macmillan) and organiser Geoff Stonebanks at 2015 opening. 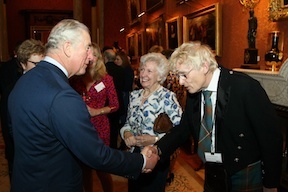 Beneath Geoff Stonebanks meeting HRH The Prince of Wales at a Macmillan reception in Buckingham Palace in 2018. On right Macmillan Chief Executive, Lynda Thomas and Geoff at Horizon Centre in 2017. Many thanks to Richard Jackson for sponsoring for 4th successive year and for the generous donation of �0, for the second year running, from Maggie Cook of Second Chance Charity Shop in Ferreiras, Portugal. 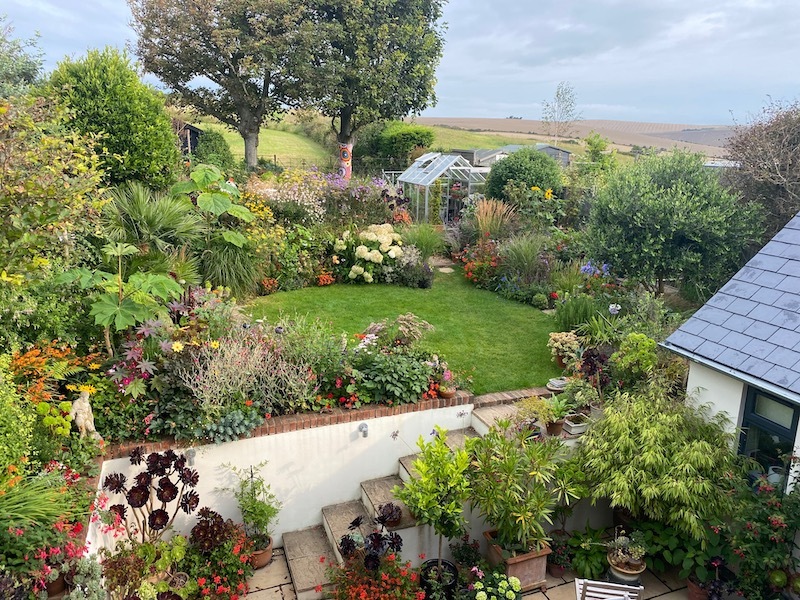 Lorna & John Davies from Skyscape, in Woodingdean, held a plant sale in April and raised �6 for the trail as well as donating a further 55 plants for trail organiser, Geoff Stonebanks to sell in his garden this summer too! 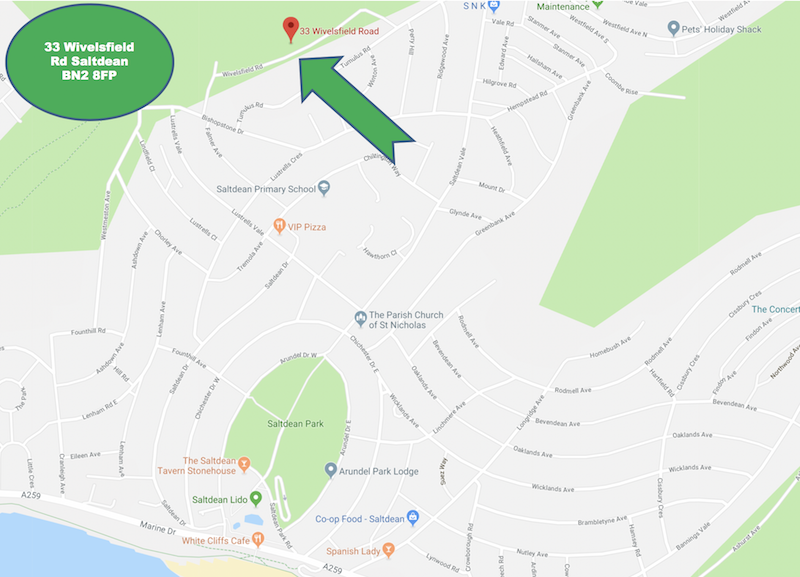 Christine Walkden has confirmed she will be in Seaford to open the trail at 11am on 27th July 2019, in trail organiser, Geoff Stonebanks's garden, Driftwood. She sent a lovely tweet wishing us well for 2019, see left and a very supportive message for our organiser on the right. At the end of the final day of the Artwave Festival at Driftwood, Tom Lay from Macmillan accepted a cheque for �515 being the monies raised for Macmillan Cancer Support from Driftwood private visits, grand artist raffle, Macmillan Coastal Garden Trail and all visitor donations in 2018, see image in newspaper feature from 7th February, promoting the 2019 trail. It also appeared online too on 10th February here. Read all about the 2018 trail here. 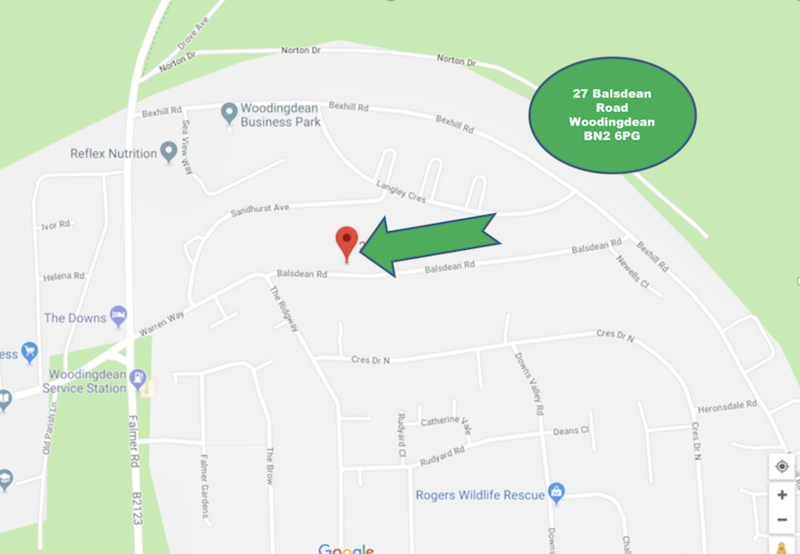 The 2019 trail will take place over the weekend of the 27th & 28th July and Christine Walkden will be at Driftwood to open the event at 11am on the 27th. Would you like to open your garden as part of the 2019 event? call Geoff on 01323 899296 to discuss. 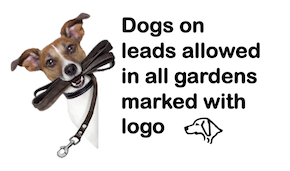 Very proudly sponsored in 2019 by Garden Media Guild's award winning web site. TV Gardener, Christine Walkden, our patron, will open the trail in 2019. Entry �per garden or �for a day ticket on Saturday and �on Sunday. 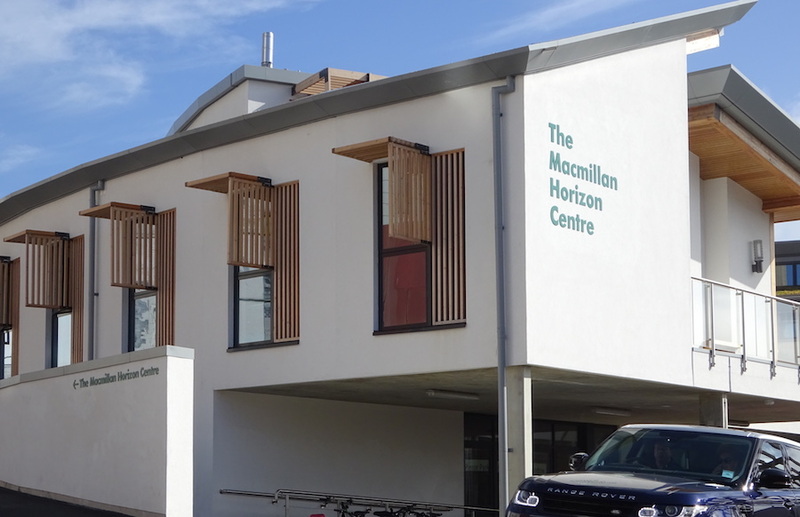 The new Macmillan Horizon Cancer Centre celebrated its 1st birthday and official launch on 22nd November 2017. Many gardens have steps and narrow paths meaning that disabled wheelchair access is not possible. Gardens opening in 2019 will be added as they sign up. 20 gardens confirmed so far. As in previous years, if you would like to support our fundraising efforts in 2019, you can donate direct, via Just Giving, by clicking the the logo to the right. 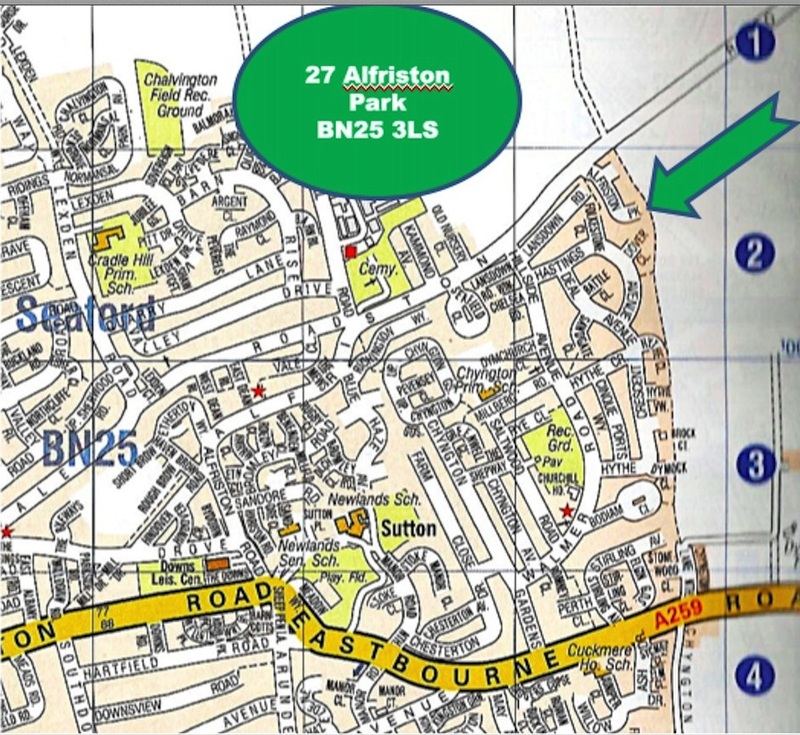 The generous people of Sussex raised �7m to help fund the building of the Macmillan Horizon Centre, but more is still needed. 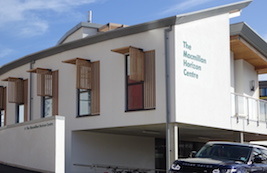 The running costs of the centre are covered by Macmillan Cancer Support, and services provided by a team of skilled local volunteers. Macmillan is funded solely by donations and the running costs of the centre are over �0,000 per annum. 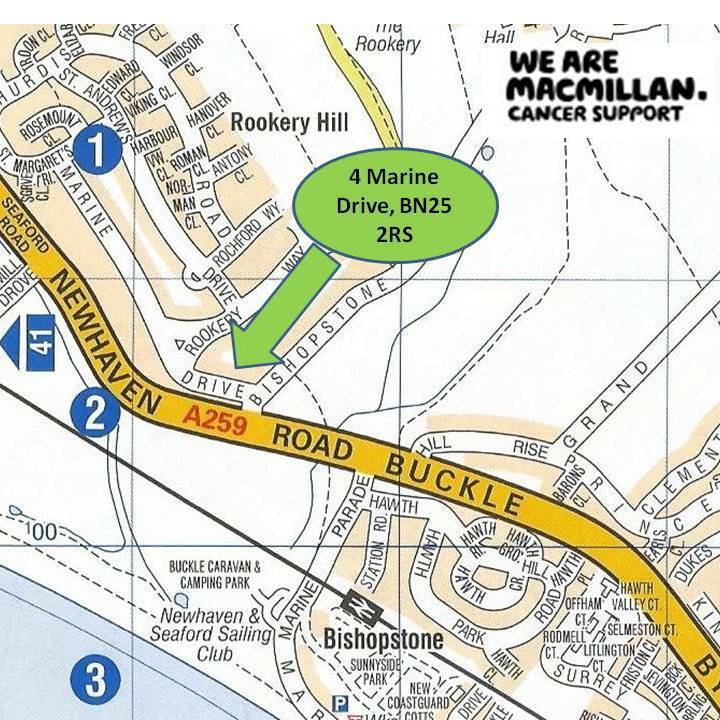 All monies raised from this trail will support Macmillan in it's operation. ALL GARDENS WILL OPEN 11AM TO 5PM, SOME ONLY OPEN ON ONE DAY, CHECK THEIR LISTING. After visiting the trail in 2018, Marie Bishop has decided to open up her own garden this year. 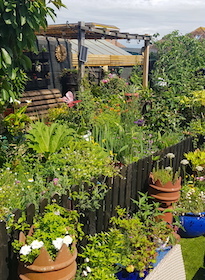 She says "I am a thrifty gardener who, for the last twelve years has been growing our small front and back gardens from scratch, trying to reuse, repurpose and recycle as much as possible. I relish the challenge of creating something new and pretty out of other people's cast-off pots, bicycle wheels,sheds, pallets, etc." 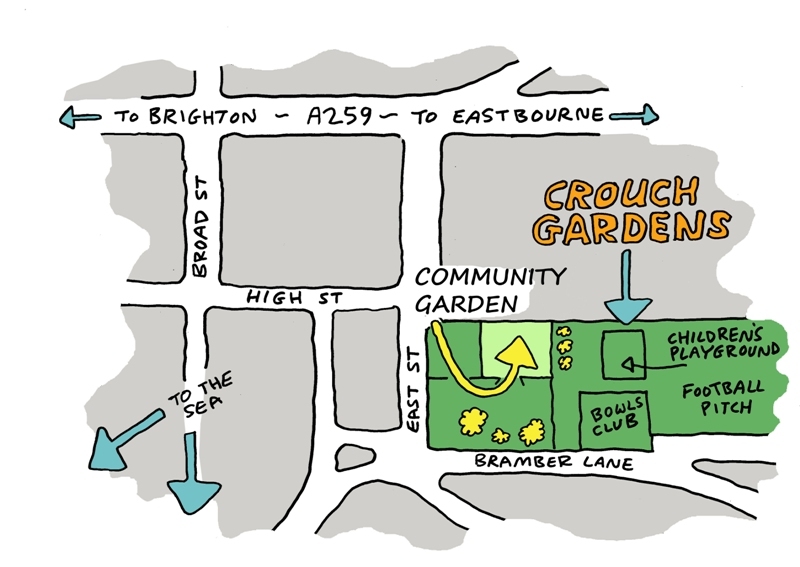 Jade Diable is going to be opening her lovely garden close to the seafront in Hove. 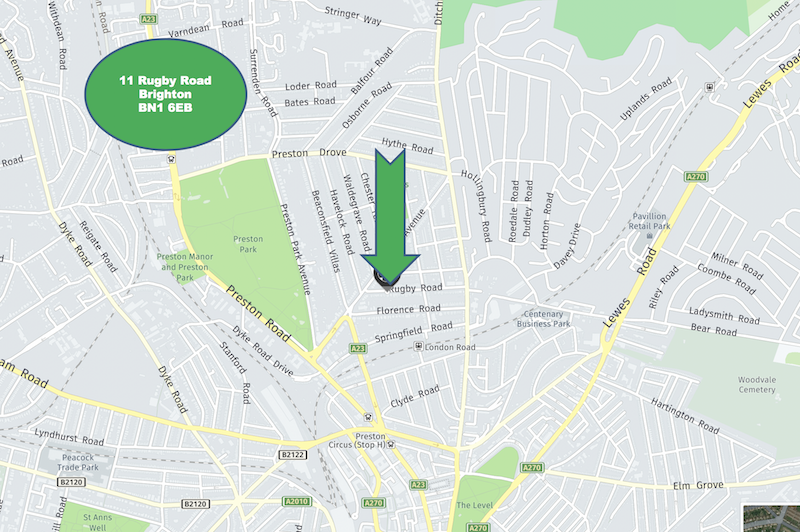 More details and full address to follow. Garden 3...... 5 Glen Rise Close, Brighton BN1 5LQ. 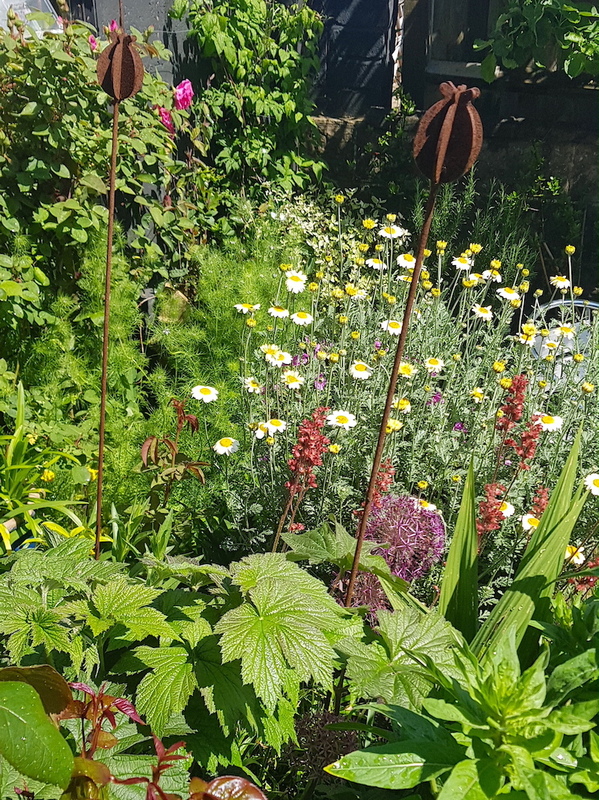 Annelise is a professional gardener who is developing a challenging garden on heavy clay into a plantsman’s paradise with an emphasis on colour, late season perennials, choice tender plants, unusual annuals and wildlife friendly areas. The garden also features a pond brimming with dragonflies and frogs, a wildflower patch, three chickens and a handmade clay oven. Come and enjoy tea and homemade cakes surrounded by colourful containers. Lindy Craig-Hall will be opening her garden for the very first time on the trail. She describes it as a rectangle located on four levels with some large well established trees and brick walls on either side.The soil is very chalky and thin. The steps are a big feature full of planted up pots. Delicious home-made tea and cakes served too. 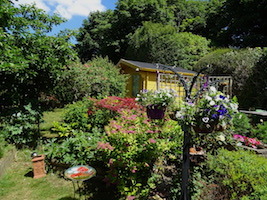 This little house in Brighton is home to Adam & Dan,1 pug and bundles of creativity. 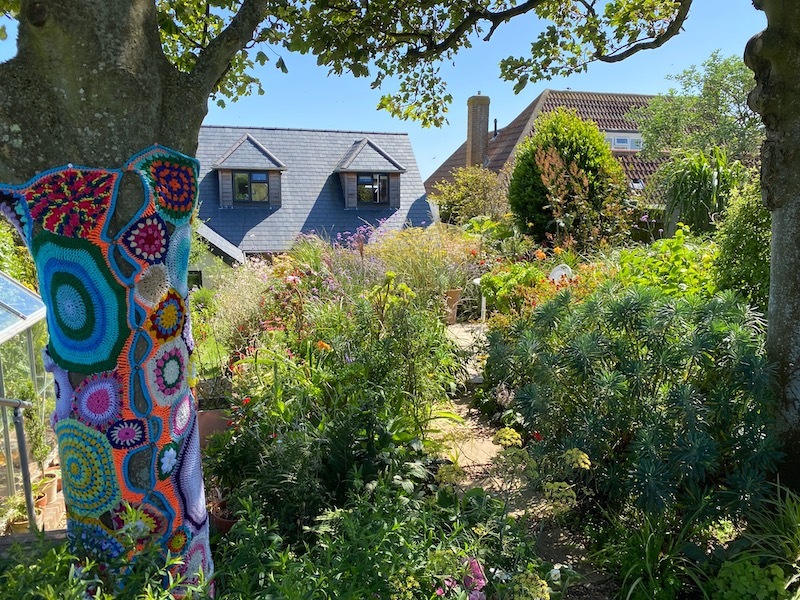 Now with beautiful garden, opening for the first time for Macmillan, it started as part of the Artists Open Houses, is now a must see on the Open House trail twice a year, get some great deals on original work here too over the trail weekend. 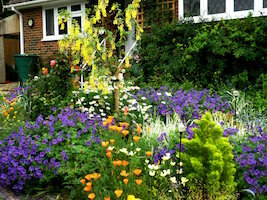 Having had a year off, Sarah and Martin have decided to open their garden again this year too! This is their garden in spring. 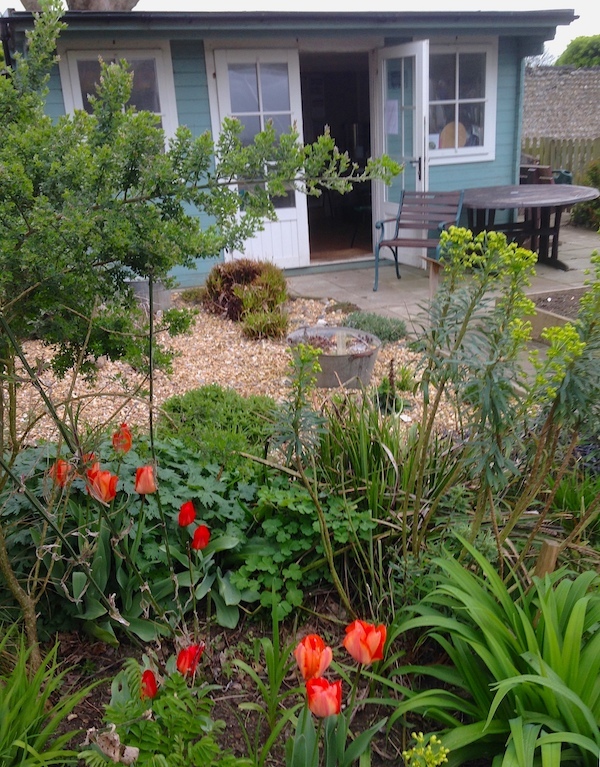 Sarah says, "please come and visit in summer and see the different spaces where we have planted mixed grasses and perennials, roses, coastal plants, a willow arch and vegetables. The outcome of various garden courses that I have attended! There are lots of places to sit and enjoy a cup of tea and cake made from garden produce." This is the third year that the new centre has been able to open for the trail. Centre manager, Geoff Brown, has agreed to open up both days, so visitors can take a look at what their donations in previous years have helped build. A member of his team will be on hand and donation buckets on display. The coffee shop will be open and visitors pay by donation too! There is a very small garden area and an amazing living roof to be seen! 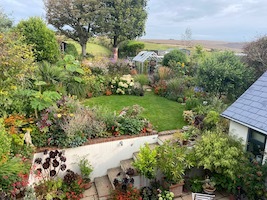 Beryl & Alan Brown will be opening their garden again in 2019. 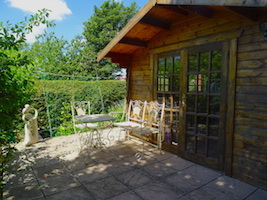 Take home-made tea and cake in the garden or on the terrace outside the Summer house. You can even visit the secret garden down the side of the property! 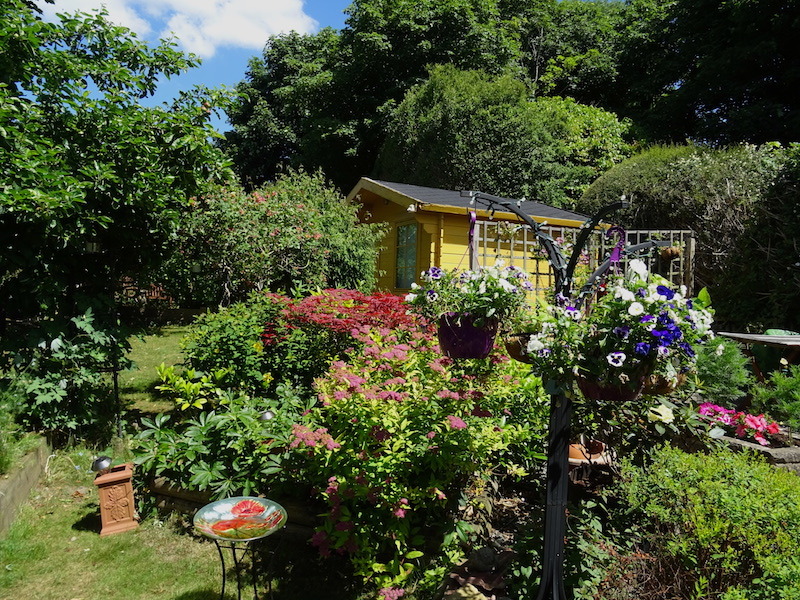 A long garden with established trees and shrubs and a sun trap in the afternoon. Ethel Trigg and Alex Thomas's garden is quite large and hugs the bungalow. It is returning after a year off. It is planted with a large variety of plants, flowers fruit trees and bushes. There is also a raised ornamental fish pond which creates quite a nice feature. 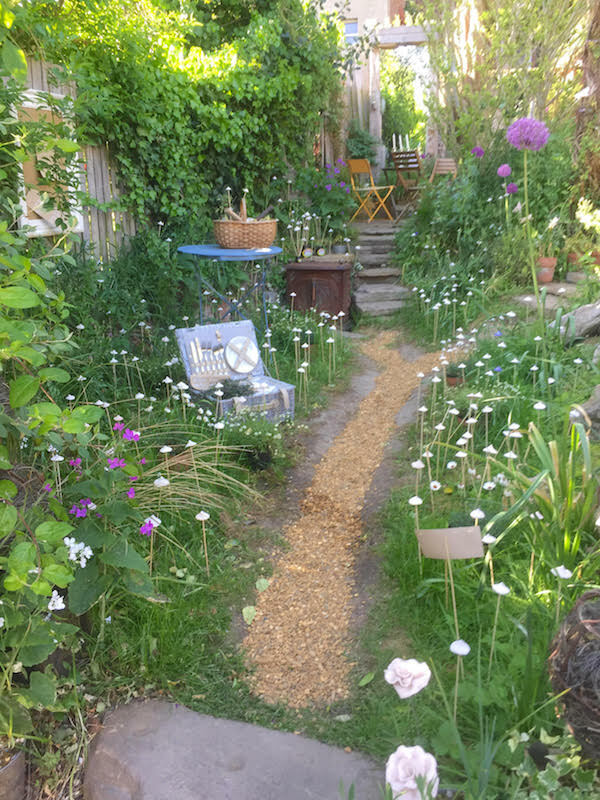 For the very first time, Chris and Steve are opening their amazing, work in progress, 3 tiered garden which includes a large meadow and field leading out to the Downs. There are beautiful succulents in containers, incredible views from the meadow to both the ocean and the Downs and lovely planting. They will be serving tea and cakes too. Steep steps to gain entry to the garden. 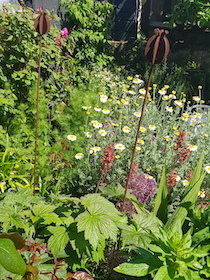 Tracy Williams will be opening her lovely small garden again after a few years break. In her own words it is described as "A garden filled with pots and containers packed with lots of lovely flowers , shrubs and veggies". 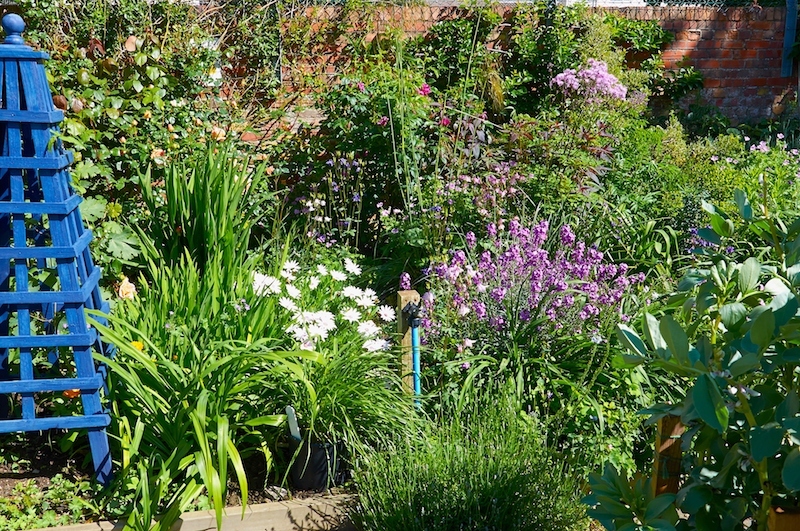 Margaret Howland is hoping to open her delightful garden in Bramber Close again. She says my garden is my sanctuary where I can loose a whole day. 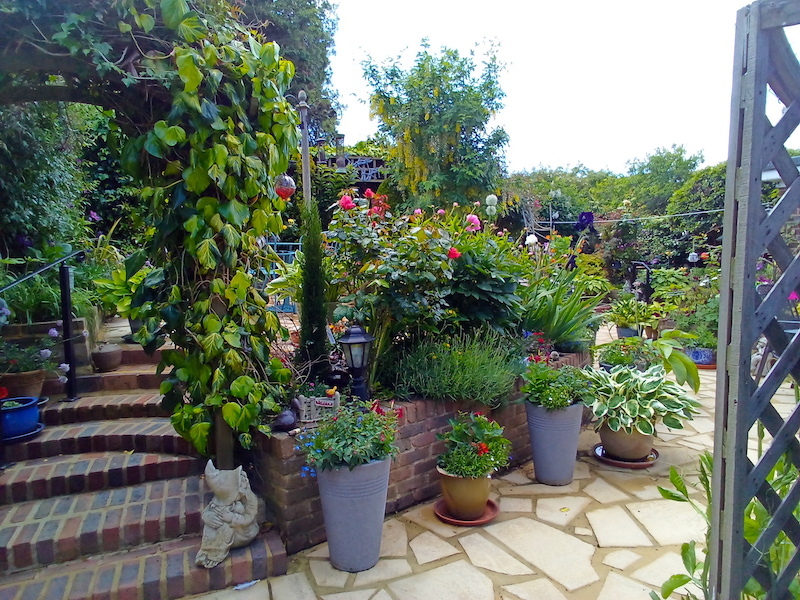 Over the years I have changed the design and moved plants and shrubs around giving me what the family call a pretty garden, with different areas to sit and enjoy the planting. Daniel and Suzy's small traditional/modern Chinese flower garden has a red, yellow and orange flowered theme, and includes a whole host of different species from crocosmia to dahlia to multiple bamboos, maples, evergreens, banana and bonsai. Please join us for a piece of cake and cup of tea served on Wedgwood. OPEN SUNDAY ONLY. Alison and Dave Standing will be opening their small but pretty cottage garden which has different seating areas. Visitors are made very welcome in a relaxing atmosphere! Teas served in the garden as well! Our patron Christine Walkden was at Driftwood for the opening of the trail in 2015. 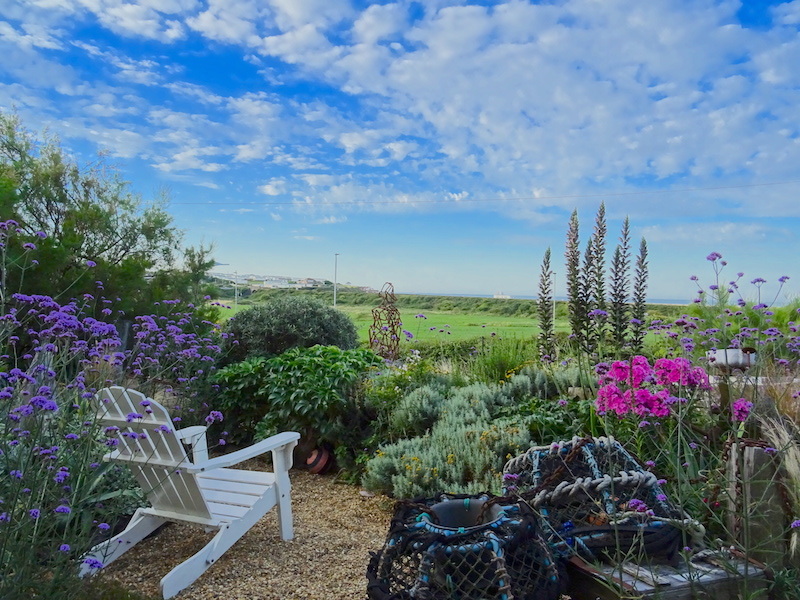 Geoff Stonebanks's garden, Driftwood , has been featured on BBC Gardeners' World, was a finalist in BBC Gardeners' World Magazine's Garden of the Year 2016 and has been seen on Good Morning Britain and had a fabulous 8-page feature in Coast Magazine in 2017. You can also read many reviews of the garden on TripAdvisor. It has also won several national awards and featured in many national and local papers and magazines. Visitors can enjoy tea on the beach garden or amongst the sumptuous planting in the back garden. Winner Best Small Garden in UK 2012 and owner of coveted Daily Mail National Competition blue plaque. 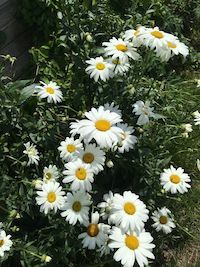 Check out the Driftwood monthly updates in the national gardening magazine, Garden News. A community garden open to all, run by volunteers with flowers, fruit, vegetables and a wildlife pond. Lots of plants for sale! 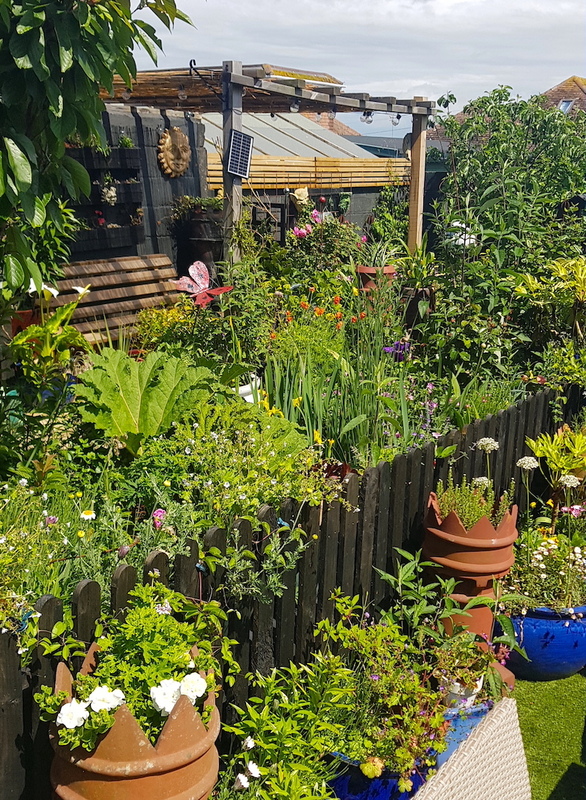 Their mission statement is to creatively develop a garden that will empower and develop the participants leading to a significant improvement in the quality of life for the wider community. Click HERE for their web site. 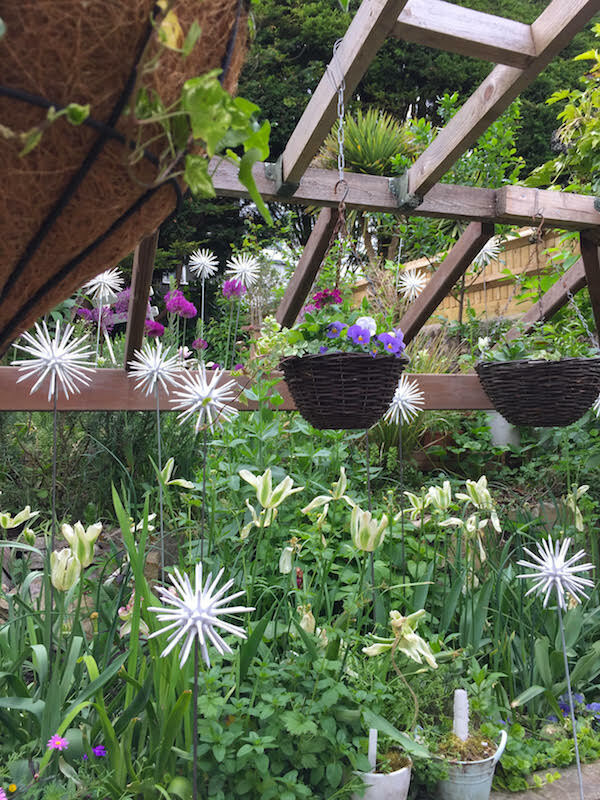 Sally Attrell is opening her delightful garden for the 2019 trail. A small oasis on the edge of Seaford. With different levels and a tranquil Koi pond to sit and reflect by. A haven for birds and humans. 6 years in the making and delicious tea and cake served on vintage china. Aileen Rhodes is opening her award winning BBC Surrey/Sussex Dig It Garden. The listed Georgian cottage with south-facing flint walled gardens has views towards Windover Hill and Lullington Church with raised vegetable beds, naturalistic herbaceous border, dwarf quince tree, cordon fruit espaliered plum, fan trained fig, clematis, soft fruit and vines. Refreshments will be served too! SATURDAY ONLY! 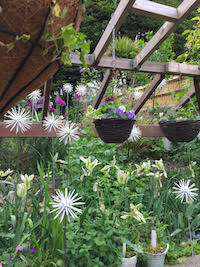 Rosalind Anesi will be opening her garden for the first time on the trail on Saturday only, more details to follow. 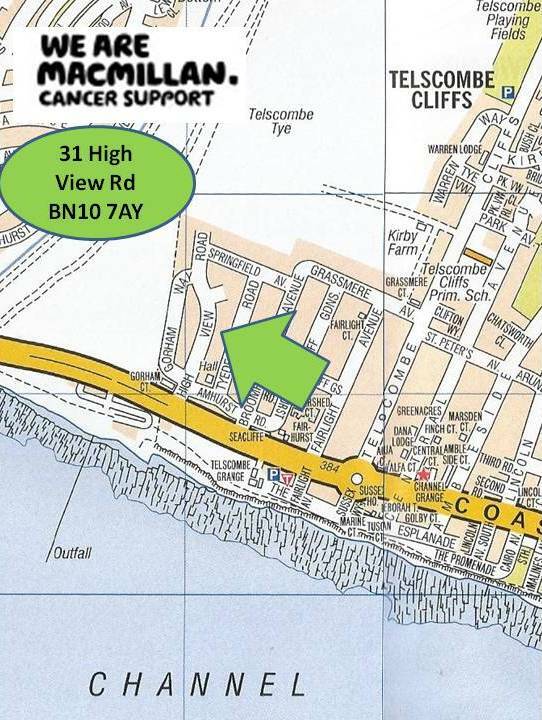 All the monies raised from entrance fees to the gardens, monies raised by selling raffle tickets, along with the proceeds from the sales of teas and coffees will go towards maintaining and operating the new Cancer Support Centre in Brighton. Any stalls operated in the gardens will donate a percentage of their proceeds to the charity as well. In addition to the monies raised on the trail Geoff Stonebanks also raises money for Macmillan through income from private visits to his own garden, Driftwood throughout the Summer, through raffle of artist donated pieces and proceeds from the sale of tea and cakes at many charity openings. Over �000 raised to date! In December 2017, trail organiser, Geoff Stonebanks, received an invitation from Buckingham Palace. 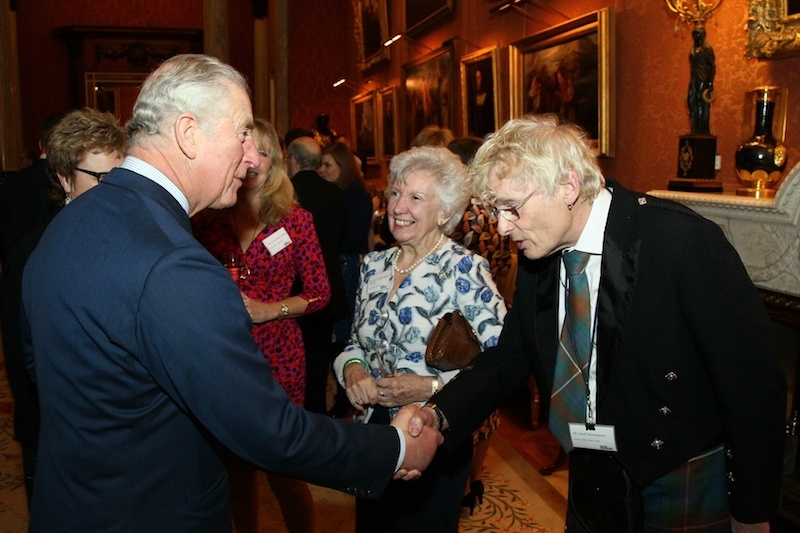 His Royal Highness, Prince Charles invited him to a reception for Macmillan Cancer Support in January 2018. Macmillan said it was a thank you for him having made a significant difference to the charity and to those suffering with cancer! Read all about his experience visiting the Palace here. 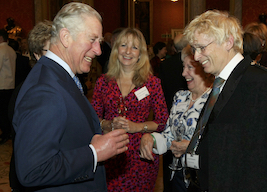 It was an amazing evening for Geoff at Buckingham Palace, in January 2018, meeting His Royal Highness, The Prince of Wales, at a reception for Macmillan Cancer Support. Richard Jackson, has very generously agreed to sponsor the trail for the 4th year in 2019! Geoff has attended a Macmillan Executive Team Meeting in the Horizon Centre, Brighton where The Trustees and Board met with groups of volunteers and staff at the centre and heard direct from Geoff about his fundraising work with the charity, both the trail and other events in his own garden Driftwood. He can be seen here with Chief Executive of Macmillan, Lynda Thomas prior to the meeting. Tom Lay, Regional Fundraising Manager at Macmillan Cancer Support said after the cheque presentation in 2018, "It was a complete pleasure to visit Geoff and his team this weekend to celebrate raising an incredible amount of money for people living with cancer. We are so grateful for the incredible efforts of Geoff Stonebanks and everyone involved in the Driftwood Macmillan Coastal Garden Trail. 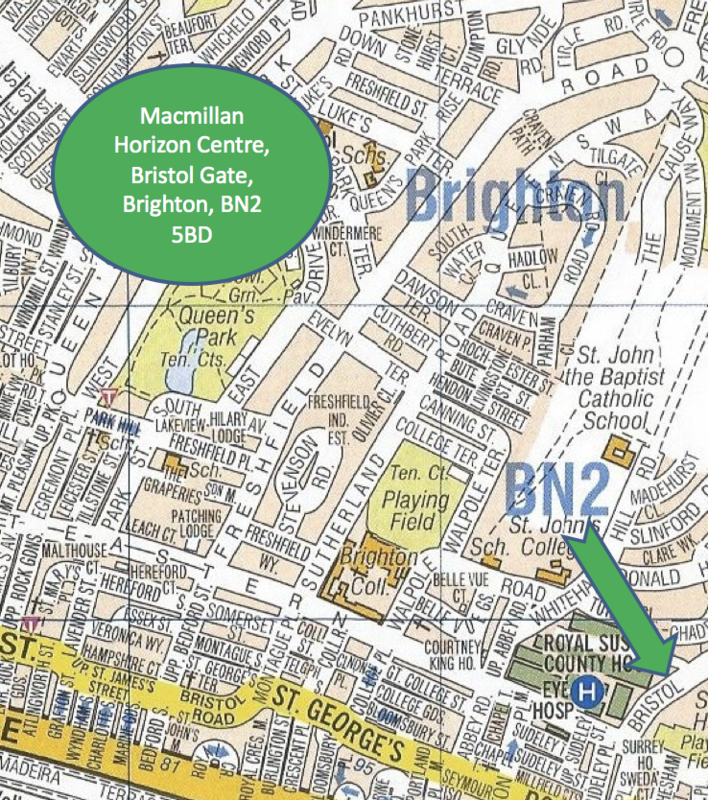 The money raised by everyone opening their gardens will make a huge difference and supports the work being done at the Macmillan Horizon Centre in Brighton and we cannot thank them all enough. 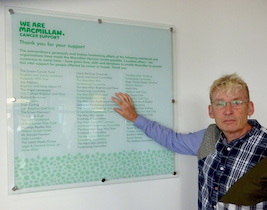 Not only does Geoff support Macmillan by organising and fundraising for this brilliant event, he raises masses amounts of awareness and we couldn't be their for people who need us without people like Geoff, the team that supports him, the garden owners and visitors who come to see these beautiful gardens." Christine Walkden's horticultural knowledge, combined with her obvious passion for gardening is what has made her a TV and radio favourite, and The One Show抯 resident gardening expert, along with being a regular pannelist on Gardeners' Question Time. Autumn 2014 saw her in a 15 part series on BBC1 called "Glorious Gardens from Above". Christine said "I support cancer charities as we have had problems in the family so I know myself what people go through and also how its upsets families as well. I just hope it may help you." See Christine's web site HERE. Surprisingly the BBC2 series Christine did a few years ago, Christine's Garden is not available on DVD but you can see them all on YouTube for free. Check them out HERE! 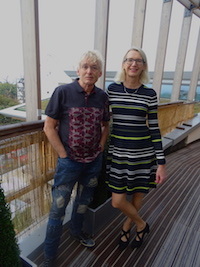 In 2015, Christine generously agreed to travel to Sussex to open the event in the award winning garden of organiser, Geoff Stonebanks. She said "Opening gardens and sharing them with others	is a great treat for all. 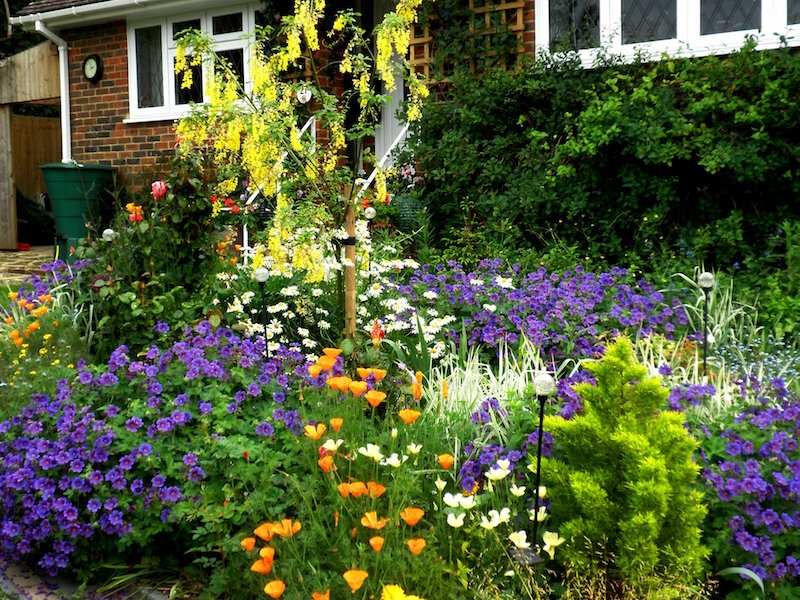 It generates a sense of community, camaraderie and interest in the beauty that gardeners create. I am thrilled to continue as patron for the fifth year, especially having seen it first hand." Christine goes on to say "There are probably umpteen better gardens down my street, but it doesn't bother me - I'm not competitive or pretentious. I don't want a showcase garden. It's the relationship I have with my garden that matters." Christine can be seen above with organiser, Geoff Stonebanks and Macmillan Fundraising Manager Tom Carter. Over �000 has now been raised by Geoff's Driftwood Fundraising Group since 2012! 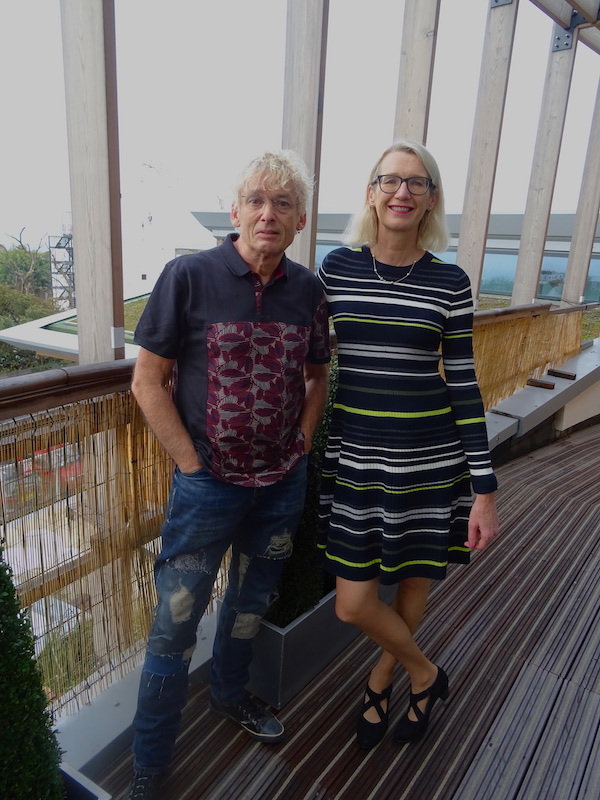 In September 2016, Geoff and some of his garden supporters, were invited to a preview of the centre and were amazed to find that Driftwood Fundraising Group was listed on the roll call of supporters who have raised money for the centre. Sussex Committees have raised over �1 million and Driftwood �000 of that. Please contact Geoff Stonebanks, the organiser for more information on the event.